A growing spat between Argentina's outgoing president and president elect over inauguration day logistics took a strange turn on Friday, with the silversmith responsible for crafting a ceremonial baton saying an assistant was threatened by possible police action. The brouhaha, which has many Argentines shaking their heads, deepened on the same day that President-elect Mauricio Macri visited neighboring Brazil, his first head-of-state visit since being elected Nov. 22. 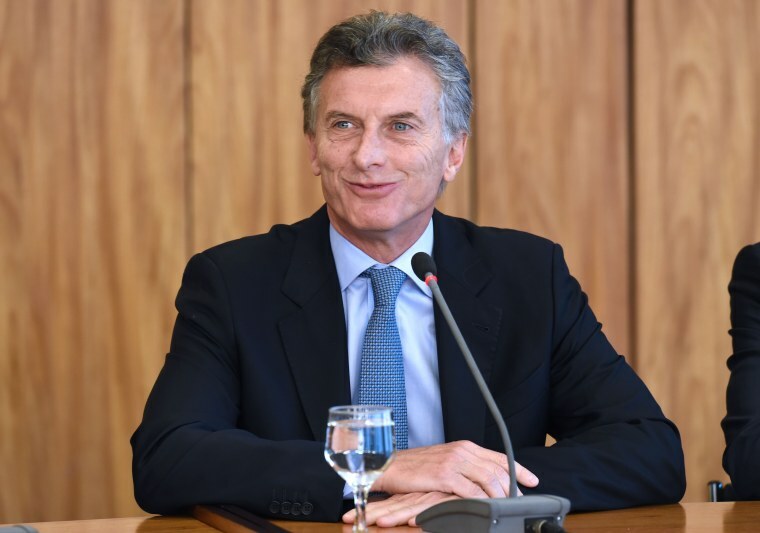 Macri wants to receive the presidential baton and sash from outgoing President Cristina Fernández de Kirchner in the government house, or Casa Rosada, during the Dec. 10 inauguration. However, Fernández administration officials insist the transfer will happen in Congress. News channels, which covered the disagreement all day, briefly broke in to show Macri meeting with Brazilian President Dilma Rousseff. Macri was asked by reporters in Brasilia about the tiff. He responded that thankfully Rousseff didn't bring it up, but otherwise didn't comment. "Many of us look at this and think, 'How embarrassing,'" said Martin Bohmer, former dean of the law school at the University of Buenos Aires. "It's amazing that we are having so much trouble transferring power." The very active social media sites in the South American nation went wild on Friday after silversmith Juan Carlos Pallarols shared his story with several news organizations. The respected craftsman has made every presidential baton since the country's return to democracy in 1983. He said Macri officials this week asked him not to turn the baton over to the current administration. But the other side also applied pressure: Pallarols said an assistant received a threatening call from a Fernández official, saying police would intervene if the baton wasn't finished and turned over soon. "It was an unpleasant situation," said Pallarols, who added that another official later called him to apologize. On Twitter, a clip from popular cartoon produced by a state television channel was making the rounds. In one episode, "Zamba," the protagonist, is visiting the Casa Rosada. A guide tells him it's "where the presidential sash and baton are handed over." The constitution establishes that the incoming president's swearing in ceremony take place in Congress, but does not specify where things like batons or sashes should be handed over. While Fernández received the baton and sash in Congress, other new presidents have received them at the Casa Rosada. "The president is within her rights," said Cabinet chief Anibal Fernández. "The articles will be in Congress. If Macri doesn't want to receive them there, then he shouldn't receive them." Fernández, a populist leader who publicly criticizes her opponents, has dominated the political landscape the last 12 years: initially as first lady during the administration of late husband Nestor Kirchner, and the last eight as president herself. News columnists and social media pundits have speculated that Macri will refuse to bow to Fernández, and will simply put on his own presidential sash or ask a top official in his administration to do it. Ignacio Fidanza, director of popular political website lapoliticaonline.com, said Fernández was being "whimsical." "She is in a state of shock after 12 years in power and doesn't understand that she'll no longer be president," said Fidanza.